This month marks the fifth anniversary of the Dodd-Frank Wall Street Reform and Consumer Protection Act of 2010, which created the Consumer Financial Protection Bureau, or CFPB. The CFPB is the only financial regulator solely dedicated to protecting consumers, and as of July 2015, it has helped return more than $10.1 billion to more than 17 million consumers tricked by deceptive financial practices. For years, critics have argued that the agency is too powerful. But the CFPB’s track record of leveling the playing field between consumers and the financial services industry has proven that the agency is worthy of longevity. Here’s why. The CFPB helps prevent consumers from being harmed, especially in the mortgage market. Consider what happened with Ocwen Financial Corporation, the country’s largest nonbank mortgage loan servicer, and its subsidiary, Ocwen Loan Servicing. As the CFPB has detailed, Ocwen took advantage of homeowners at nearly every stage of the mortgage servicing process. It inaccurately reported payments, charged borrowers unauthorized fees, and provided misleading information when customers complained. Ocwen did not inform its customers about foreclosure alternatives and failed to accurately calculate borrowers’ eligibility for loan modifications—or denied them completely. These deceptive and unfair practices contributed to foreclosures for nearly 185,000 borrowers. The CFPB took swift and decisive action. Under the bureau’s direction, Ocwen gave $2 billion in relief to underwater borrowers and returned $125 million to its foreclosed borrowers. The CFPB also ensures that the consumer protections in Dodd-Frank are implemented. The CFPB enforces the law’s Regulation Z, or “Ability-to-Repay,” standard, which requires lenders to verify whether a borrower can pay back a mortgage before getting one. In addition, the CFPB implements Dodd-Frank’s mortgage servicing rules, which make sure that borrower accounts are handled correctly and that servicers help borrowers who find themselves in mortgage trouble. If the CFPB’s mortgage regulations had existed before 2008, lenders would have been unable to issue the subprime loans that led to the collapse of the housing market, and mortgage servicers potentially would have been able to prevent millions of unnecessary foreclosures. The crash and ensuing recession ultimately affected all Americans—not just the ones who had taken out mortgages. When American consumers are protected, so is the entire U.S. economy. This year, the CFPB is considering new regulations on payday lending, one of the most prevalent and insidious forms of predatory lending. Payday loans create debt traps for low-income borrowers through high interest rates and unaffordable loan terms, and their effects ripple through families and entire communities. Because of the CFPB, payday loans are finally receiving the federal attention they deserve. 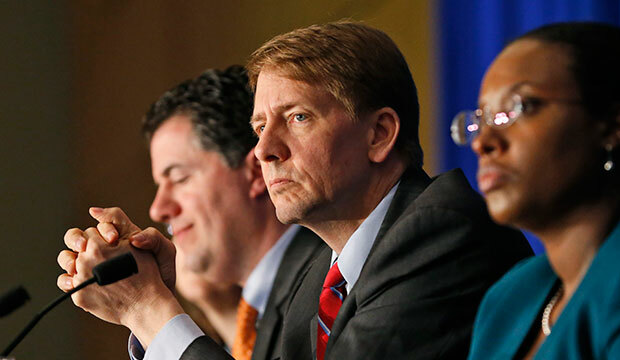 Part of the CFPB’s success against companies peddling predatory financial products results from the agency’s engagement with the American people. Its publicly searchable complaint system and database allows the CFPB—as well as advocacy groups, industry players, and other consumers—to identify problems quickly and easily. This system helps keep the CFPB focused on pursuing relevant solutions to problems that matter to families and has handled more than 650,000 consumer complaints. The CFPB uses these online resources to remain aware of emerging unfair, deceptive, and abusive practices, allowing the bureau to evolve as fast as the market does. The structure and independence of the CFPB is essential to its success. Unlike many commissions that face significant gridlock when they seek to take action, the CFPB is governed by a single director rather than a multiperson board. Additionally, independent funding allows the CFPB to focus on protecting consumers rather than kowtowing to financial services lobbyists. Not surprisingly, American consumers demonstrate overwhelming support for tougher financial rules and enforcement. A 2013 national poll found that after being provided a short description of the organization, more than 8 in 10 respondents “favor” the CFPB, and almost half strongly favor it. Overall, support for regulation of Wall Street has only increased in the years since the financial crisis. Seventy-three percent of respondents to the same poll in 2012 supported tougher rules and enforcements. In 2013, support grew to 83 percent. In the most painful way possible, America learned what happens when financial oversight is not taken seriously. Without the CFPB, financial products could once again trap families in crushing debt, exorbitant fees, or the inability to pay back predatory loans, which could send the economy into a new tailspin. Stronger and safer financial services help the United States grow. America needs the CFPB in order to ensure that those services—and a healthier economy—are here to stay. Camille Galles is an intern with the Housing and Consumer Finance team at the Center for American Progress.